When injuries occur as a result of an accident, it can be a devastating and life-changing event. When another individual is responsible for the injury, it may be necessary to seek compensation for damages. When a you or a loved one has suffered an injury that was caused by another's negligence, recklessness or intentional harmful act, it is crucial that you get legal help from a Long Island personal injury lawyer to assist you with the legal aspects of your case. Even though insurance companies often make settlement offers, it is strongly advised that you do not discuss your case with an insurance investigator or take settlement offers without first discussing your case with a personal injury attorney from Jacoby & Jacoby. The legal team at the firm is extremely experienced and qualified to assist you in seeking maximum compensation for the damages you have suffered. When facing serious injuries, it is important that the legal aspects of your case are fully reviewed and evaluated by an experienced personal injury lawyer. Medical bills, loss of income, loss of quality of life, and many other types of damages could be possible, depending on the extent of the injuries and how your day-to-day life has been affected. Each case is unique, and with a full review of the circumstances of your case, the legal team at Jacoby & Jacoby can advise you of how to proceed with your claim for damages. At Jacoby & Jacoby, the legal team can assist you with any type of personal injury case, including car accidents, truck accidents, bus and public transportation accidents, motorcycle accidents, pedestrian accidents, and bicycle accidents. If your injuries were caused due to another person's reckless actions, such as a drunk driver or a negligent property owner, our law firm can help you file a claim for compensation. We handle all premises liability cases, including slip and fall accidents, school accidents, dog bites, trip and fall accidents, food poisoning and security negligence. After your loved one has been injured at work such as at a construction accident or due to a defective product, do not hesitate to call a Long Island personal injury attorney from the office. Our law firm can also help you file a wrongful death claim on behalf of a loved one. Regardless of the particular circumstances of your case and the specific issues or concerns you have, there is much that an attorney can do. An initial case evaluation by a Long Island accident lawyer can reveal the merits of your case to determine who can be held accountable, approximately what your case may be worth, and what the next logical step should be to seeking justice. From there, your attorney can work to assist you with any insurance claim involved with the injury or accident and can assist you in filing a personal injury lawsuit against the responsible party. Our firm is here to represent your interests in whatever type of personal injury case you need assistance with, including any claim arising from a dangerous drug, medical malpractice or birth injury, dog bite, work-related accident or any other situation. Our injury attorney can seek compensation! When facing serious injuries, the last thing you may want to think about is dealing with insurance companies, claim forms, or proving your case. Fighting with insurance companies can be a real nightmare, and as they are very large corporations, their usual focus is on their own bottom line - profits. When you accept a lesser settlement amount, the profits are higher. This is sadly true, but there is a solution for those who have to deal with this huge profit making corporations: contact a personal injury lawyer from Jacoby & Jacoby to take it on. This will allow you and your family to focus on what is most important - your health and recovery. At Jacoby & Jacoby, the legal team will make your personal injury case a priority. Each case is taken personally, as it is fully understood how important the case is to the injured client and their families. Take advantage of the years of experience and dedication of the personal injury law firm of Jacoby & Jacoby. Serving Long Island, Suffolk, Nassau and Queens with high quality legal representation in personal injury and wrongful death cases. We are here to help you rebuild toward a brighter, more secure future. View our firm's profile at FindaPersonalInjuryAttorney.com. 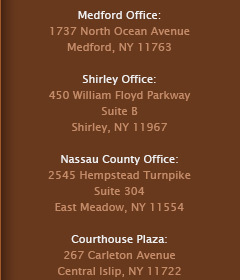 Jacoby & Jacoby - Long Island Personal Injury Lawyer Located at 1737 N. Ocean Ave, Long Island, NY 11763. Phone: (888) 452-2629. Local: (631) 289-4600. Website: https://www.longislandinjuryfirm.com/.